Scenes of violence and incisions into the flesh inform　the demand for law. The scene of little girls being held down in practices of female circumcision has been a defining and definitive image that demands the attention of human rights, and the intervention of law. But the investment in protecting women and little girls from such a cut is not all that it seems. 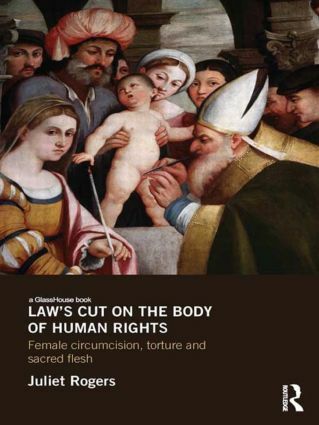 Law's Cut　on the　Body of Human Rights: Female Circumcision, Torture　and　Sacred Flesh　considers how such images　come to inform law　and the investment of advocates of law in an imagination of this scene. Drawing on psychoanalytic and　postcolonial　theory, and accompanying ideas in political theology, Juliet Rogers examines the language, imagery and excitement that accompanies recent　initiatives to legislate against what is called 'female genital mutilation'. The author compliments this examination with　a consideration of the scene of torture exposed in images from Abu Ghraib and Guantanamo Bay. Rogers argues that the modes of　fascination and excitement that accompany　scenes　of torture and female circumcision　betray the fantasy of a　political condition　against which the subject of liberal law is imagined; this is subjectivity　in a　state of non-mutilation, non-prohibition or, in a psychoanalytic idiom, non-castration. To support the fantasy of this subject,　the mutilated subject, the authors suggests, is rendered as flesh cut from the democratic nation state, deserving of only selective human rights, or none at all.